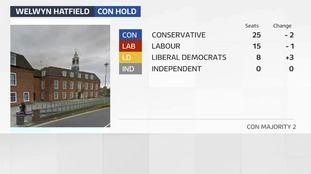 It was among one of the last results to be declared and was one of the most sensational - the Liberal Democrats overturning a Conservative majority of 15 and securing one of their own by a margin of 15 seats. 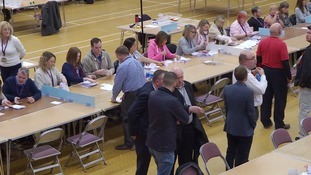 South Cambridgeshire becomes the only council in the Anglia region to be run by the Liberal Democrats with their own secure working majority. Boundary changes helped as did a reduction in council seats from 57 to 45 but it is still a remarkable turn around on a council that's had a Conservative majority since 2001. The area has had a history for being independently-minded as the council was run by Independents from 1972 until 1993. 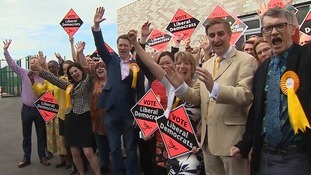 Liberal Democrats support has been growing in the area which was among the most strongly in favour of staying in the European Union. The district forms a ring around the city of Cambridge serving communities in Cambourne, Histon, Great Shelford and Melbourn. 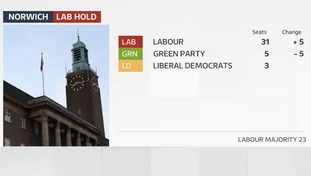 Labour are firmly in charge at Norwich City Council after increasing their majority from 13 to 23. The Green Party have long been the main opposition group in Norwich but has been in decline in recent years. Labour took five seats from them in this election reducing the party to a rump of just five councillors. Norwich has been a Labour council for most of its existence but was briefly controlled by the Liberal Democrats from 2002-04. The Conservatives have become the biggest party in Milton Keynes but did not secure a working majority meaning parties will have to work together. Labour had been running a minority administration since 2014 and the council has been hung for many years. Milton Keynes is the biggest non-county local authority in the Anglia region serving a population for more than 250,000. It is a single-tier unitary authority which means it runs all the local services in its area rather than being spilt between district and county councils like most of the region. Great Yarmouth was once a major stronghold for UKIP but no longer. The party is reduced to a single councillor following losses in the local elections and a mass defection to Conservatives in October 2017. In the local election in 2014, UKIP had taken 41% of the vote. One EU Referendum later the local election in May 2018 saw the party take less than 5% of the votes. 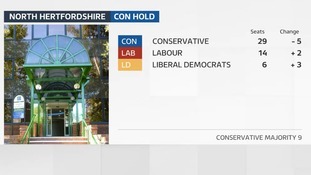 The Conservatives increased their majority while it was Labour that made the most gains in the town that has the Conservative Party Chairman, Brandon Lewis as its MP. 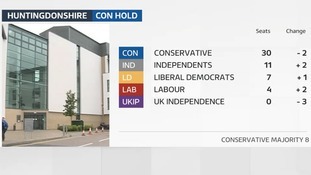 The Liberal Democrats have snatched a flagship Conservative council in South Cambridgeshire which did have a Tory majority of 15. 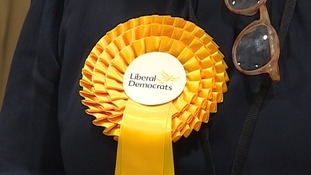 Boundary changes in the area meant that the council already had 12 fewer seats than before the election but the Lib Dems have won an overall majority of their own. No all the results are in but the Liberal Democrats have already taken 28 seats - five more than necessary for control of the council. The district was among the strongest Remain areas in the country in the EU referendum two years ago. Would you pay more for extra police in Essex?